30 Water Villas, 20 Baros Villas, 24 Deluxe Villas and one Baros Residence. Baros is located 25 minutes by speed board from the airport. There are regular direct flights from UK, Germany, Italy, France, Russia, Spain, and Switzerland in Europe and Dubai and Qatar in the Middle East. Singapore, Malaysia, India and Colombo in Asia. 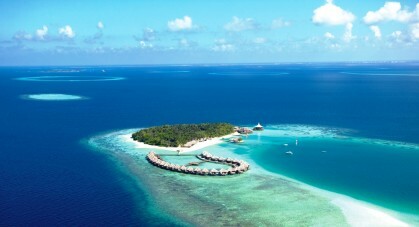 Baros is a luxury beach resort located in the Maldives on a remote private island. The resort is the ideal tropical getaway with reef-ringed shore, swaying palms, crystal blue lagoon and luxurious villas surrounded by lush gardens. The accommodation consists of a variety of villas which are located either on the beach or over the blue lagoon which surrounds the island. The villas are made of sandstone and timber and ensure complete privacy for all guests. Please refer to side menu for further details on the Baros Villa Accommodation. Another feature of Baros resort is the unique dining experiences that are on offer here. There is the Lime Restaurant which is an open sided pavilion built over the water offering enticing dishes from around the world. The Cayene Grill offers al fresco dining in thatched gazebos over the lagoon, and the Lighthouse Restaurant also offers further superb cuisine to its guests. If you feel like more privacy, there is in-villa dining, or on request you can dine anywhere on the island – be it the beach under the stars or in a secluded palm grove. The staff at Baros are there to serve your every need! They look forward to welcoming you to the beautiful private paradise in the Maldives. AQUUM spa offering a range of massage, health and beauty treatments, SCUBA Diving, Water Sports Centre, snorkelling - Baros has an excellent reef edge only 10-15 metres from the beach, pool table, table tennis, Male shopping, island hopping, big game fishing, sea plane flights, sunset cruises, and surprise picnics.